This entry was posted in Contests, Giveaways and Promotions, Green Parenting, Parenting and tagged ergobaby, giveaway. Bookmark the permalink. Take care of my toddler! Serious, Anne, it’s the only way! If I had a wrap/carrier I would go hiking with her, and use it at the grocery store! Sounds interesting, would love to try it out. If I had a baby carrier, I could walk my dog(s), make dinner, work on crafts, get around the house a little easier, and go to the grocery store without having to worry about carrying the big car seat. Thank you! Having an Ergobaby wrap would make it easy to take my baby girl out and also to get many things done at home with her on me. This is awesome ! 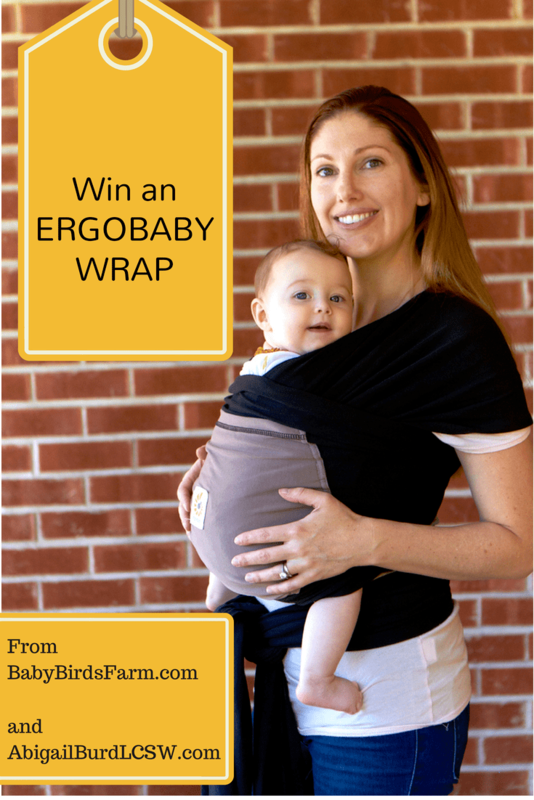 I never knew that ergo made a wrap :) would love to win this ! Hopefully I’d have less back pain while carrying a baby if the weight is centralized! If I had a baby carrier I would wear my little girl during the day! She is due in 2 weeks and I can’t wait to wear her! I would take my baby on more outings! I’m limited to using public transportation and it just isn’t so easy to be hauling a stroller around. Baby carrying is the best! I do household chores carrying my baby and he just loves it, especially since he has been extra clingy lately! if I had a baby wrap I would wear it everywhere and would say goodbye to our stroller. I hang laundry on the line a lot while baby wearing. Now little man likes to run around the yard, but baby #2 will need a place to be next summer when I hang up laundry again! I wore my baby while working from home. She napped on me and I was able to get work done on the computer while getting my baby snuggles. Would love to have a great wrap to start baby wearing and have my hands free to take care of housework, the dog, etc! I’ve attempted doing housework while carrying my baby in another type of carrier…one with buckles and straps and clips, she hated it! This would be so much more comfortable for her, she loves to snuggle!! I do pretty much everything while baby wearing. Our new baby boy just turned 2 months old and doesn’t want to be put down. Ever. I would never be able to keep up with our 2.5 year old without baby wearing. I would love this as I could do much more than I can right now. I use my one piece sling rarely, as my son Odin is very long at 3 months! It’d be nice to be able to cook, clean, go to the bathroom WITHOUT always having to hold him! I would be able to take care of my 5 year old & do stuff around the house much easier with my newborn! Being able to baby wear and take care of things around the house would be great. You can sweep, straighten up and do dishes. How very cool. My baby is 7 now. I miss things like this… holding him close. LOVE! With a wrap carrier we’d be more inclined to go on more walks, hikes, etc. i have done everything from cooking and cleaning to going to sporting events! This would be a great gift for my daughter! She is expecting her first child in a couple of weeks!